What is the first thing that comes to mind when someone mentions the Galapagos Islands? Marine iguanas, giant tortoises or even the blue-footed booby? You probably weren’t thinking of the snails? Most people wouldn’t as these little creatures are some of the least known terrestrial species in the Galapagos Islands. However the land snail population now consists of over 70 described species and makes up the largest radiation of any animal or plant on the Archipelago. Colonising the Galapagos Islands approximately five million years ago, the combined effects of island age, elevation and limited competitors were the driving force in this extreme diversification. These remarkable animals have exploited nearly every single habitat across the 13 islands, ranging from elevations of around 40 metres to over 700 metres. Each species has a relatively small distribution and is extremely well adapted to the small niche it inhabits. Shell shape and size vary greatly with elevation and play a key role in mobility, exploitation of different food sources and use of varying shelters. Like many species in Galapagos, the isolation of the snails for millions of years have made them extremely susceptible to change. In the past, people have settled in what are termed ‘colonised zones’ and across these zones large areas of native forests have been cleared for agriculture. This large-scale land use, combined with the snails’ small distributions, have pushed many populations to the brink of extinction. Several invasive species were accidentally introduced in the early 1900’s and, in many cases, outcompeted the native wildlife. One such species was the African land snail. An indiscriminate eater, growing over eight inches and feeding on over 500 different species of plant, this snail is having damaging effects on the Islands’ habitats and native flora species. 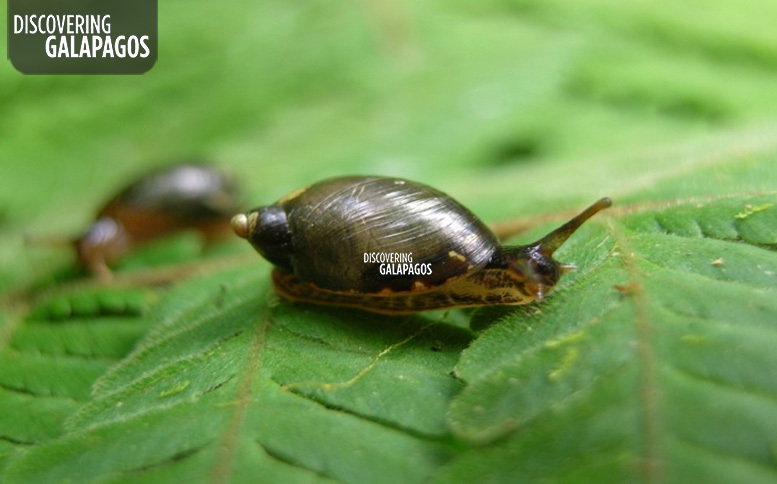 This has resulted in 13 endemic species of snail being listed as critically endangered by the IUCN. Over the past 15 years, the importance of Galapagos snails has be realised. Their unique diversification and evolutionary history is one of the best examples found anywhere on the planet. Land snail specialists on Galapagos have been developing programmes to explore and understand the distribution and diversity of new species discovered. The monitoring of well-described species has allowed specialists to understand population trends and factors that can affect population numbers and working alongside the National Trust, has enabled them to better understand which habitats or zones should be protected, to ensure the longevity of the irreplaceable Galapagos snails. Click here to visit our Teacher Zone where you can download the complementary evolution lesson plan. Categories: Wildlife of Galapagos | Tags: evolution, Galapagos Snail, radiation, species.